Mécanisme de la physionomie humaine. 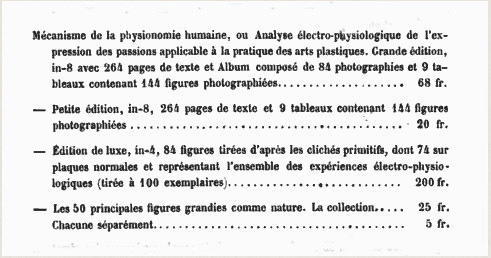 ou, Analyse électro-physiologique de l'expression des passions des arts plastiques. Duchenne de Boulogne, Guillaume-Benjamin-Amand, 1806-1875. Paris : Jules Renouard, 1862. Petit édition : frontis., vi, [1 l.], 70, (v)-xi, 194 p, [9 l. pl] ; ills. : phot. frontis., 9 photo composites (144 figs.) ; 28 cm. Grande édition : text vol.— vi, [1 l.], 70 p., [1 l.] pl, xi, 194 p. ; 28 cm. ; atlas vol.— 4 p., frontis., 9 l. pl (composites), 84 l. pl ; 29 cm. Grande édition de luxe : frontis., 84 (dbl. col.) p, [84 l.] pl ; 41 cm. Photographers : Duchenne de Boulogne & Adrien Tournachon (1825-1903). 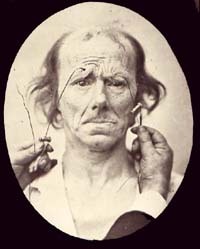 Subject : Mimetic muscles — Physiognomy; electrophysiology. Author caption: Par le Docteur G.-B Duchenne (de Boulogne). Lauréat de l'Institut de France (concours sur l'électricité appliquée) et de l'Académie de médecine de Paris (prix Itard), chevalier de la Légion d'honneur. Second octavo editions, published by J.-B. Baillière (Paris: 1876). Second octavo editions with error in pagination (skipping page numbers 127, 128). Abstract: Archives générales de médecine, vol. 1, p. 29-47, 152-174. Photographs reduced in size for the two octavo editions. One hundred copies of the quarto (Grande édition de luxe) issued. Copies of the quarto edition vary in presentation and retouching of the photographs. An early copy of the quarto edition with 74 plates (72 albumens) sold for 204,000 euros in 2004. Text and photographs republished in part by Darwin, The expression of the emotions in man and animals, (1872). The young man portrayed is Jules Talrich (1826-1904), artist and model maker for the Faculté de médecine. Index Medicus: 11102391340, 20405271060, 21701331010. 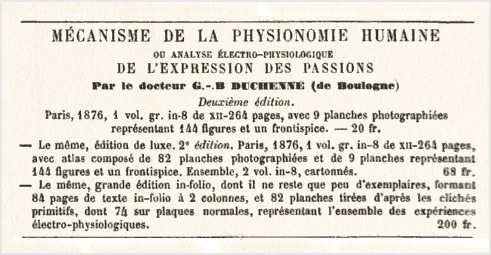 For the American reception, read the obscure 1870 review of the Mécanisme Physionomie written by Dr. M. L. Edgeworth for Hammond's Journal of Psychological Medicine»». The citations of this master work are too numerous to list. The Duchenne scholar will find that many of the references are accessible on the internet as well as at least two online facsimilies of the book itself (BIUM, France »» ). 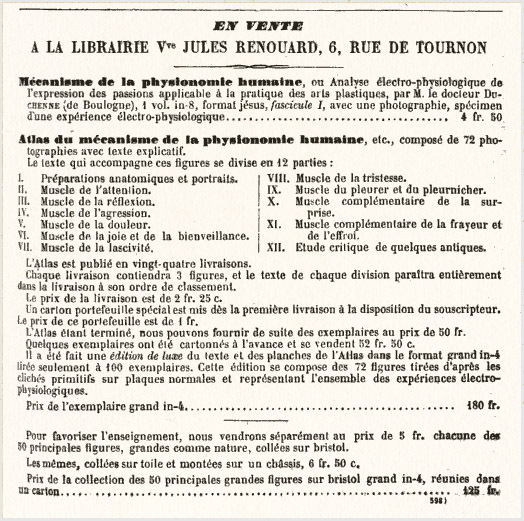 The quarto, Grande édition de luxe, was sold by subscription and the first copies issued were illustrated by 72 albumens, comprising a frontispiece portrait of Duchenne with his subject and albumen plates numbered 3-73 (plates 1 and 2 are engravings). Later copies are illustrated by a complete set of 84 numbered whole plates (82 albumens) in addition to the frontispiece and another 9 albumen plates that are composites of 144 figures, reproducing just the heads of the subjects portrayed by the whole plates. Most copes of the octavo, Grande édition, have the same illustrations, but they are reduced in size. Variant copies of the large octavo edition have the composite plates and some number of the whole plates.